GitHub - AI-HELP/AIhelp-Android-SDK: AIHelp android SDK. Want to be notified of new releases in AI-HELP/AIhelp-Android-SDK? a. Copy files under folder aihelpsdk/libs to the the libs folder of your APP's project. b. Copy files under folder * aihelpsdk/res* to the res folder of your APP's project. elvachatservice depends on design, which depends on appcompat, recyclerview and cardview. You must use ELvaChatServiceSdk.init(...) in your APP's Initialization Code, otherwise you can't use AIHelp service properly. // Must be called during application/game initialization, otherwise you can't use AIHelp APIs properly. // You can set initialiation callback to track if AIHelp SDK initialization is completed. // “elva-tags" is the key name, not a variable. // “elva-custom-metadata" is the key name, not a variable. config: Optional parameterseters for custom HashMap information. You can pass specific Tag information using ArrayList elva-tags, see the above coding example. Please note that you also need to configure the same tag information in the Web console so that each conversation can be correctly tagged. 3. Call the showConversation method to start the manual customer service interface. // "elva-custom-metadata" is the key name, not a variable. Usually you don't need to call this interface unless you want to set a trigger point in the app, giving the user a chance to go directly to the manual chat interface. defaultTabIndex: Optional. The index of the first tab to be shown when entering the operation interface. Default value is 0, default value is the left-most tab, if you would like to show the AI conversation interface(the right-most) set it to 999. If the username is not obtained, the empty string "" is passed, and the default nickname "anonymous" is used. If the userid is not available, the empty string "" is passed, and a unique device id is generated. ELvaChatServiceSdk.setUserName("user_name"); // set User Name If the username is not obtained, the empty string "" is passed, and the default nickname "anonymous" is used. ELvaChatServiceSdk.setUserId("user_id"); // set User Id If the userid is not available, the empty string "" is passed, and a unique device id is generated. 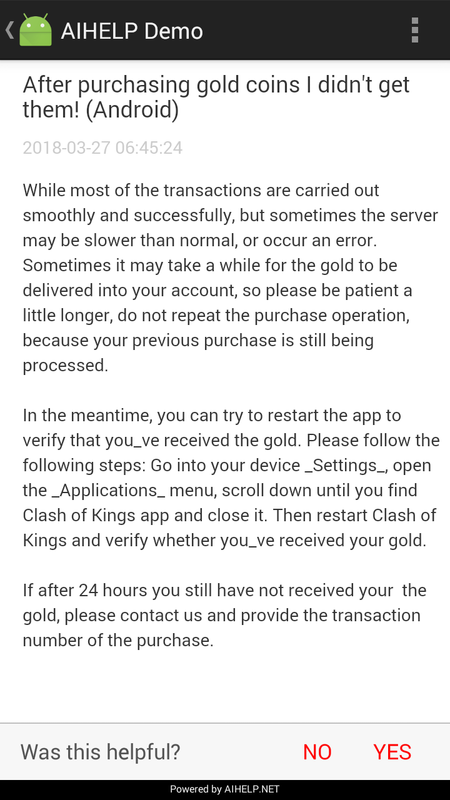 Use this method to show FAQs about your APP/Game properly. Configure FAQs in AIHelp Web Console. Each FAQ can be categroized into a section. If the FAQs are many, you can also add Parent Sections to categorize sections to make things clear and organized. | sectionPublishId | String | The classification number of the FAQ classification. 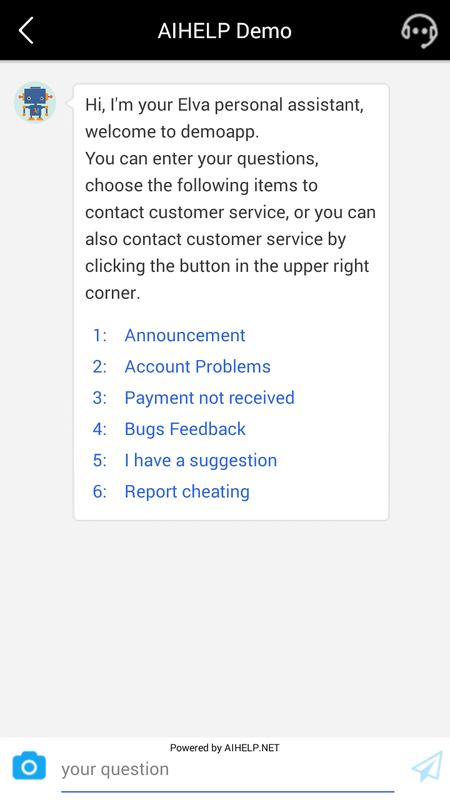 Open AIHelp Customer Service Background and find the category number of the specified FAQ category under Robot→Frequently Asked Questions→[Classification]. Note: This sectionPublishId cannot fill in the category number that does not exist in the customer service background. 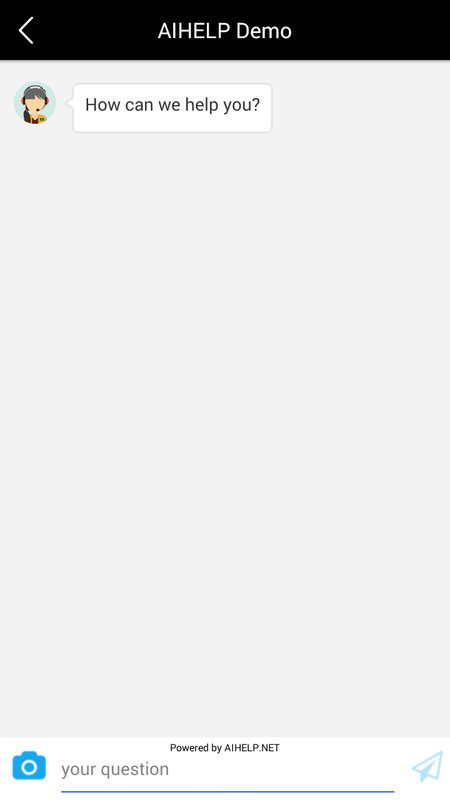 In the FAQ entry of your application, trigger the call of this interface. For example, you have configured the category FAQ about the mall or recharge in the [AIHelp Customer Support] 1 page. After you call this interface in your store interface or recharge interface, all the FAQs in this category will be displayed. If you configure the "self-service" link in the FAQ's configuration, and set UserId, UserName, ServerId in the SDK, then the FAQ shows a functional menu in the right-top cornor. ELvaChatServiceSdk.setUserId(String playerUid); If the userid is not available, the empty string "" is passed, and a unique device id is generated. ELvaChatServiceSdk.setUserId("123Abc567DEF"); If the userid is not available, the empty string "" is passed, and a unique device id is generated. ELvaChatServiceSdk.setUserName (String playerName); If the username is not obtained, the empty string "" is passed, and the default nickname "anonymous" is used. ELvaChatServiceSdk.setUserName ("player_name"); If the username is not obtained, the empty string "" is passed, and the default nickname "anonymous" is used. Normally you do not need to use this method if you have passed the user name in another method. However, if you want to use FAQ's Self-Service, then you must set the User Id first. ELvaChatServiceSdk.setUserName("user_name"); If the username is not obtained, the empty string "" is passed, and the default nickname "anonymous" is used. language: Standard Language Alias. For example: en is for English, zh_CN is for Simplified Chinese. More language label can be selected through AIHelp Web Console:"Settings"-->"Language"->Alias. If your allow users to change the APP language, then you need to call this method to make AIHelp the same lanague with your APP.